"WHO'S BEEN SITTING IN MY CHAIR?" and the middling Bear said. "WHO'S BEEN SITTING IN MY CHAIR?" and the little Bear said, "Who's been sitting in my chair and has broken it all to pieces?" And then they went to have their milk, and the big Bear said, "WHO'S BEEN DRINKING MY MILK?" and the middling Bear said, WHO'S BEEN DRINKING MY MILK?" and the little Bear said, "Who's been drinking my milk and has drunk it all up?" Then they went upstairs and into the bedroom, and the big Bear said, "WHO'S BEEN SLEEPING IN MY BED?" and the middling Bear said, "WHO'S BEEN SLEEPING IN MY BED?" and the little Bear said, "Whos been sleeping in my bed?—and see here he is!" So then the Bears came and wondered what they should do with him; and the big Bear said, "Let's hang him!" and then the middling Bear said, "Let's drown him!" and then the little Bear said, "Let's throw him out of the window." 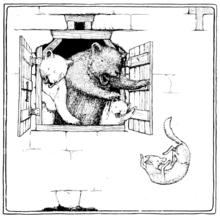 And then the Bears took him to the window, and the big Bear took two legs on one side and the middling Bear took two legs on the other side, and they swung him backwards and forwards, backwards and forwards, and out of the window. Poor Scrapefoot was so frightened, and he thought every bone in his body must be broken. But he got up and first shook one leg—no, that was not broken; and then another, and that was not broken; and another and another, and then he wagged his tail and found there were no bones broken. So then he galloped off home as fast as he could go, and never went near the Bears' Castle again. This page was last edited on 28 August 2010, at 10:39.